New York, NY: Roc, 2001; $5.99 paperback; 328 pp. This review originally appeared in the November 2001 issue (#159) of The New York Review of Science Fiction. Scott MacKay’s first sf novel, Outpost, was a haunting piece of science fiction that blurred the lines of genre literature. Though the novel was definitely sf, a pervasive Kafkaesque quality made it feel more like a work of dark fantasy. Despite a few highly implausible plot turns, especially towards the end, it was an aggressive piece of writing that hinted at great potential for MacKay as a sf novelist. Yet, despite mostly favorable reviews, Outpost didn’t garner much attention from the field. 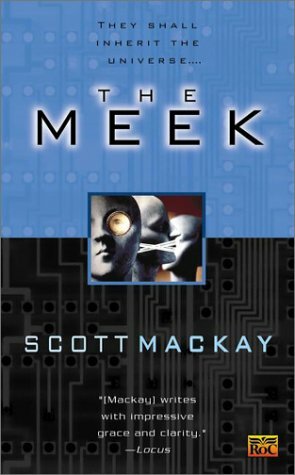 MacKay’s second sf novel, The Meek, takes a much more conventional approach. Whereas Outpost blurred genre lines and had an intricate, slowly unfolding plot that traveled across time, The Meek is a straightforward novel that carefully stays within the sf tropes and makes its revelations in a more linear fashion. Do not misconstrue that, however, as saying that MacKay has decided to blaze an easier trail with this book. The Meek shows much of the daring and dense storytelling exhibited in Outpost. From the start, MacKay displays a knack for making sure the reader pays close attention. Initially, The Meek reads as a mystery novel with the characters trying to resolve unexpected conditions on Ceres, an asteroid thought completely abandoned and devoid of life for thirty years. Ceres—initially used as a nursery, among other things, where children born extraterrestrially could mature under more Earth-like conditions—harbored the worst incident of violence in decades. Massive violence by a group of genetically engineered humans, the orphans, eventually led to the evacuation of all unaltered humans and the complete extermination of everyone left behind. Yet, when a corps of engineers comes to investigate the asteroid and to bring its support systems back online, they find structures that shouldn’t exist, a lichen-like plant growing literally everywhere, an ultra-thin atmosphere, and the possible presence of intelligent life-forms of indeterminate origin. The mystery is solved soon enough when the engineers discover that the genetically altered humans survived the neutron bombs and decompression of the station. At first, the Meek, as the orphans now call themselves, seem content to sabotage all efforts to return Ceres to operational status. However, they soon demand that the engineers leave the asteroid and let them have it to themselves, just as they have for the previous three decades, but the Council, the body governing life on the asteroids, refuses to give up its plans. In the years following the abandonment of Ceres, space-born children acquired an increasing number of maladies resulting from growing up in ultra-low-g conditions, and the Council insists that the only solution is to return Ceres to its former use. A standoff ultimately ensues, with another potential attempt at extermination of the Meek looming. Before the Council can deliver a decisive military strike, the Meek manage to move Ceres from its orbit so that it can rendezvous with Carswell, a rogue planet that is briefly entering the solar system before continuing its lonely journey through space. Their goal is to transfer their entire population there, where they can live in peace without the interference of the rest of the human race. Unfortunately, the conjectured conditions on Carswell differ somewhat from what the Meek ultimately encounter. Given the number of bloated tomes that currently populate shelves at the bookstores these days, it is surprising that The Meek did not end up inflated into two novels, especially considering the density of its plot. My summary oversimplified a bit, but both portions of the book — the conflict between the Council and the Meek and then the emigration to Carswell — provide MacKay with enough possibilities to turn each into a separate novel. In fact, given its open-ended conclusion, The Meek could have easily provided the first two-thirds of a trilogy. However, the novel surprisingly comes in at just 328 pages; not necessarily small, but in a world where larger books seem to take more space, in every sense, MacKay’s dexterous handling of The Meek is quite refreshing. Of the two potential novels, the immigration to Carswell proves the more interesting. MacKay actually postulates an intriguing idea: a planet following a cometlike orbit but geothermally active enough to support life while traversing the nether regions of space. In the maneuvering of Ceres, accomplished via an ultra-small black hole contained in its hollowed-out interior, Carswell’s orbit is altered so that it will never enter the solar system again. Given the antagonism between them and normal humans, it’s something that the Meek gladly accept. However, after they move to Carswell and attempt to start a new existence, the Meek discover that the planet is already inhabited by intelligent lifeforms that defy all attempts at understanding or communication. In fact, a risk MacKay takes with these lifeforms is that the humans never find a way to communicate with them. It’s an unusual step, one rarely seen in novels containing alien first contact. However, a densely packed, fast-moving plot will not carry a book by itself, and the biggest strength of The Meek is its characters, particularly the protagonist, Cody Wisner. One of the engineers sent to reclaim Ceres, he is still grieving for his wife, dead for three years, when events start to unfold. Cautious and empathetic, Cody finds himself trapped in the middle when the conflict begins. He understands and appreciates the need to restore Ceres to its former function, but he also feels that the Council unrealistically expects the Meek to bow to its demands. He also shows much more foresight than many of the other characters, often finding and suggesting the least obtrusive solutions to problems that he and his crew encounter. It’s his empathy and middle-of-the-road sensibility that ultimately save members of his crew when conflict with the Meek begins, and eventually save the Meek as well. However, thanks in part to the grief from his wife’s death, his empathetic skills are not individually tuned, and as a result he sometimes blindly hurts individuals, such as one engineering team member who carries an unrequited crush on him, while he pursues his big-picture goals. In pursuing those goals, he receives the help of Lulu, a member of the Meek inexplicably drawn to Cody when he and the other engineers first land on Ceres. In some ways, she is actually a more pivotal character than Cody. Without her actions, which went against the wishes of the leadership of the Meek, Cody would not have survived their initial assault. Lulu ends up becoming the bridge between the Meek and the humans who eventually decide to assist them in their quest for a new homeland. In doing so, she finds an inner strength and resolve that allow her to fully assert herself as an individual rather than remaining just a member of a clan, and brings her in control of her own destiny. As she finds herself, she also manages to show Cody how to put his grief aside and finally love again. By the end of the novel, the two of them form a true partnership, one that seems to work on all levels. The one constant obstacle that Cody and Lulu face in their struggles is Buster, the leader of the Meek. At first he appears to be the stereotypical leader out to get what he wants at all costs. While his goal of getting the Meek a new home away from human interference is noble in light of the conflict thirty years earlier, his single-minded determination to get it done nearly gets all the Meek killed. However, as the novel progresses and Lulu is able to lead him to new ideas of how to reach those goals, we see Buster’s flexibility and his ability to change. These are important traits, given that Lulu was originally his wife. Despite much jealousy and anger, he lets go of her because he realizes that she and Cody share something that he would never have with her. As events unfold, so does Buster’s character and by the end of the novel, you understand and sympathize with the way he acted when Cody’s team first landed on Ceres. In fact, the closest the book comes to a two-dimensional character is Kevin Axworthy, the head of the military team sent by the Council to support Cody and his team. Like Buster, he initially appears as a stereotype; one of a typical hardheaded commander capable only of following orders. However, as the story unfolds, we find that his antagonism towards the Meek is well founded. During the original uprising on Ceres thirty years earlier, Kevin’s father, who had worked on finding a solution that would allow the orphans to rejoin society in a normal fashion, was killed by orphan extremists for supposedly turning his back on their cause. However, as he gets to know the Meek, he realizes that they are different from their orphan predecessors and eventually commends Cody for thwarting the Council’s plans. His ability to get past his prejudices ultimately allows him to learn surprising new things about his long-lost father. Although it’s just his second sf novel — he has also written a couple of mystery novels — MacKay deserves your attention. Both The Meek and The Outpost show that MacKay has great potential as a sf novelist. He shows great imagination and the ability to populate his fantastic worlds with memorable situations and characters. He also displays the courage to take some risks, and you definitely won’t find yourself traveling over well-worn terrain or tropes. This entry was posted in Book Review, Matthew Appleton, Scott MacKay. Bookmark the permalink.